Awarded a JUNO for best world music recording, this album is a festive combination of breathy Andean flutes, jazzy vibraphone, zesty acoustic guitars and Central American percussion peaks the interest and gives enjoyment of both critics and music lovers. Acoustic Mirage features Ancient Cultures' richly-hued Andean sounds. The musicians' mastery of such South American instruments such as the quena (reed flute), zamponas (pan pipe) and charango (a small guitar) captures the soul of the Andes, past and present, with music that is at once powerful, haunting and sweet. The combination of breathy Andean flutes, jazzy vibraphone, zesty acoustic guitars and Central American percussion on this group's Acoustic Mirage release a few years ago peaked the interest of both critics and music lovers. 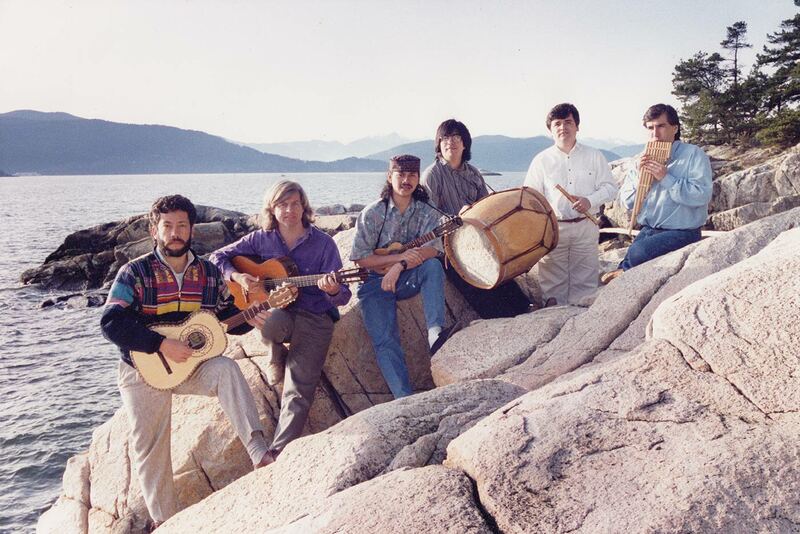 The release of this new album, El Camino Real, (The Royal Highway), sent the message clearly down the full length of Canada's national highway (Route 1) from Lotusland (Vancouver) to the nation's music capitol (Toronto) where the band was awarded a JUNO in 1994 for best world music recording. This ensemble embodies the most obvious example of the wealth of the Vancouver recording scene. A few years ago, WCMR reviewed South American poet David Campbell's Hidden Tears. I spoke with David and was struck by his gentle manner, striking imagery, and his concern for his homeland and for fellow expatriates who were finding a home in Vancouver where their music was able to flourish. Ancient Cultures contributed some tracks to that cassette release. Since that time they have really come into their own. The magic that occurred when Edward Henderson invited Carlos Cortes and his Central and South American pals to contribute music for the film The Elusive Dream speaks for itself. I discovered their music when I acquired a copy of the previous Ancient Cultures release, Acoustic Mirage. This tape has become a regular source of entertainment around our house. Kyle, who is ten years old, really digs it. Ditto for the adults. Now that we have the El Camino Real CD we have two choices when it comes to new age listening. The spirit of El Camino Real continues the uplifting spirit of Ancient Cultures, dedicated to preserving Andean folk heritage but unafraid of exploring new frontiers of world music. The cover of El Camino Realis a digitally scanned image of a South American artifact, a true example of modern technology connecting and delivering the past to the present. Take a stroll down the 'Royal Highway' with Ancient Cultures, you will be wafted back and forth through past and future as gently as a feather in the wind. Throb to the acoustic rhythms of cloves, bongos, timbales, congas, the bombo, maracas, charangos, shaken bean pods and rain sticks while being serenaded by latin vocals, throbbing acoustic guitars and the distinctive haunting melodic Quena (flute), Zampona (pan pipes) and percussive vibraphone. This is music that makes me smile:) The traditional South American flutes, guitars and upbeat rhythms make for a joyous mix that I play in the car almost every day and background for working around the house. Ancient Cultures, based in Vancouver, is composed of a mixed group of musicians. Alberto San Martin, Carlos Cortes, and Angel Araos come from Chile, but their musical roots are in jazz, folk, and classical music respectively. Fito Garcia comes from Guatemala and arranges and plays salsa music. Edward Henderson is from Vancouver Island where he grew up playing folk and classical music. Carlos Galindo Leal is from Mexico and has many years experience playing Spanish and Latin American music. Their debut album, Acoustic Mirage/Espejismo Acustico, combines their musical backgrounds into a deft, understated, weave of Latin American music. It is a beautiful, introspective offering. By their second album, El Camino Real, the group achieves full maturity. Awarded a Juno in 1994 as "Best World Beat Recording," the album displays more creative energy and a clearer sense of direction. This is a fine, sure album that should be on playlist of anyone who loves Latin American music. And for those who like Christmas albums with a twist, The Miracle of Christmas, which features the Vancouver Chamber Choir along with the Latin American folk instruments, is an album that is irresistible.